A few weeks ago, I had to give you more bad news about sugar. It's not only bad for your health, it's also bad for your skin. And one of the reasons that it's so bad for your skin is that excessive sugar in the body contributes to the creation of advanced glycation end products (AGEs). And AGEs do exactly what it sounds like they do — they make you and your skin look older. In a study published earlier this year in BioResearch Open Access, researchers decided to investigate the effects of individual AGEs on skin. They reconstructed skin using enriched collagen. They found that some AGEs significantly decreased collagen. Our skin is made up of three types of collagen: Type I, II, and III. Type III is what we all want the most of because it's the most stable and maintains its integrity and strength the longest. Glycation, unfortunately, transforms Type III into Type I. Type 1 is more fragile. When Type 1 becomes predominant and Type 3 diminishes, we are left with skin that looks and feels less elastic and less vibrant. And then — the ultimate assault — AGEs dramatically compromise our skin's natural antioxidants and defense system. This leaves our skin vulnerable to age spots and environmental damage — including sun damage. So what do we do? If you're looking to be thorough and create a REAL difference — one you will see — you have to think inside and outside. Start by fighting back internally. This means reducing your AGEs naturally. To do this, you have to minimize your sugar intake. Have your doctor check your HgbA1c. If it's higher than 5.5, consider using Advanced Blood Sugar Formula. Take two in the evening at bedtime. Take it for three months to put your blood sugar levels back in good order. The less blood sugar circulating through your body at night, the more your body can repair itself — and that includes your skin. It's always wonderful when you can get healthier inside and a side effect is our appearance improves! Next, fight back externally. To do this, take Système 41's Night Treatment. It's full of antioxidants and skin protectants. This formula has now revived thousands of women's faces. Apply it nightly. I have so many patients who have used this inside/outside approach. 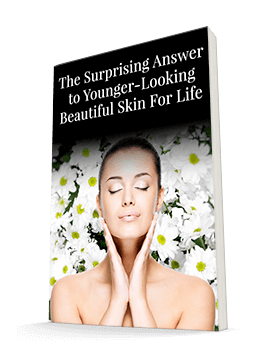 Most of my patients report noticing a difference in their skin after a short three weeks. If you try this, please get back to me and let me know how it works for you.